Experience the excitement of the movie when you play as Harry, Ron, & Hermione in a breathtaking adventure packed with action and magic. Cast spells using your stylus as a wand. Care for your own magical creature. Dual against other in 2-player wizard dueling mode. 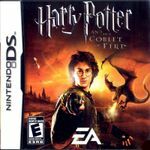 Compete in the Tri-Wizard tournament mini-game.